2016 is flying by! I can’t believe it is already mid-June…but I love summer and I’m so excited about the upcoming warmer months! 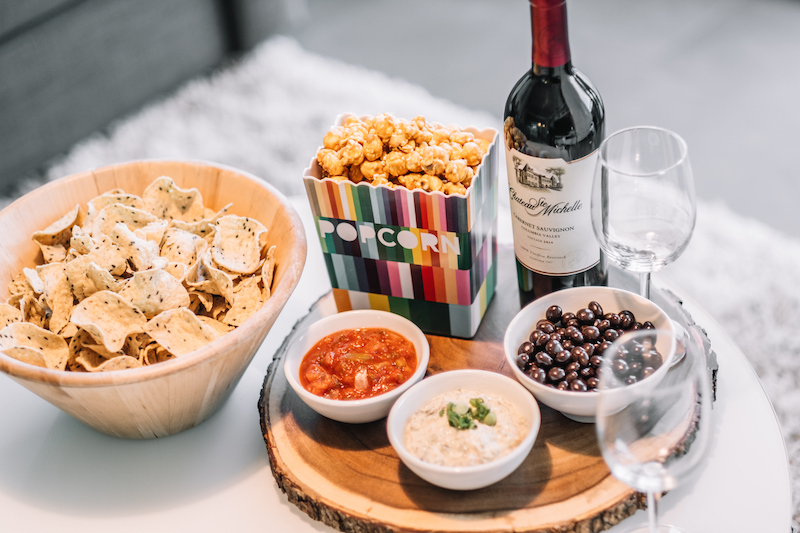 It’s the perfect time to plan some fun outdoor activities with friends and loved ones, and then relax with some me-time at home with a good book! Today I’m super excited to partner with Chateau Ste. 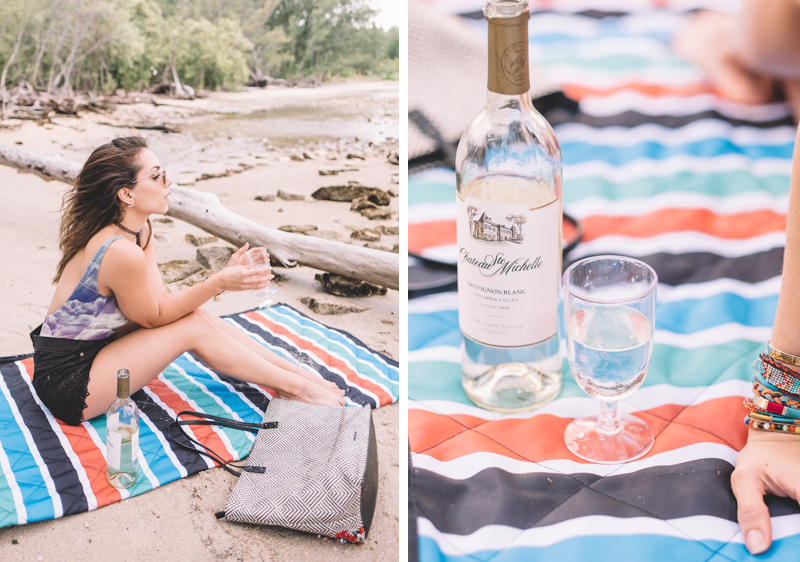 Michelle to show you 10 stylish outfits with their respective fun summer activity and perfect wine pairing! 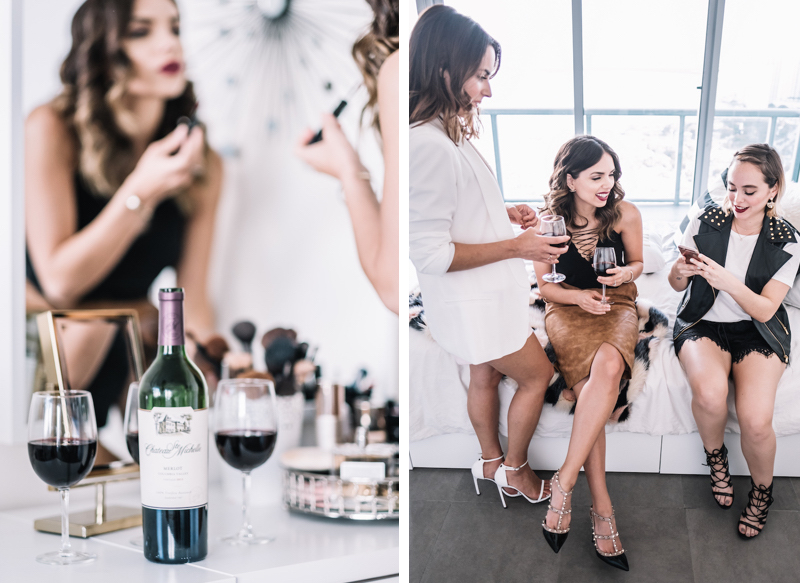 I had a blast doing this post: planning each activity, inviting friends over, and celebrating the little moments with them and a glass of wine. Chateau Ste. Michelle has been producing classic Washington wines since 1967- and I can say I just found a new favorite in the 10 wines I tried over the past few weeks! Yo no puedo creer que ya estamos a mediados de junio. A mi me encanta el verano porque me parece el momento perfecto para planear actividades divertidas al aire libre con tu familia y amigos...y bueno también relajarte un poco y leer un libro en casa. Hoy estoy muy contenta de colaborar con Chateau Ste. Michelle y mostrarles 10 looks perfectos para diferentes actividades de verano y que vino puedes servir en cada una. De verdad que la pasé increíble haciendo este post...planeando cada actividad, invitando a amigos a la casa, y celebrando los pequeños momentos con ellos con un vaso de vino. Chateau Ste. Michelle lleva produciendo vinos desde 1967... y les puedo asegurar que encontré muchos favoritos mientras hacíamos este post. 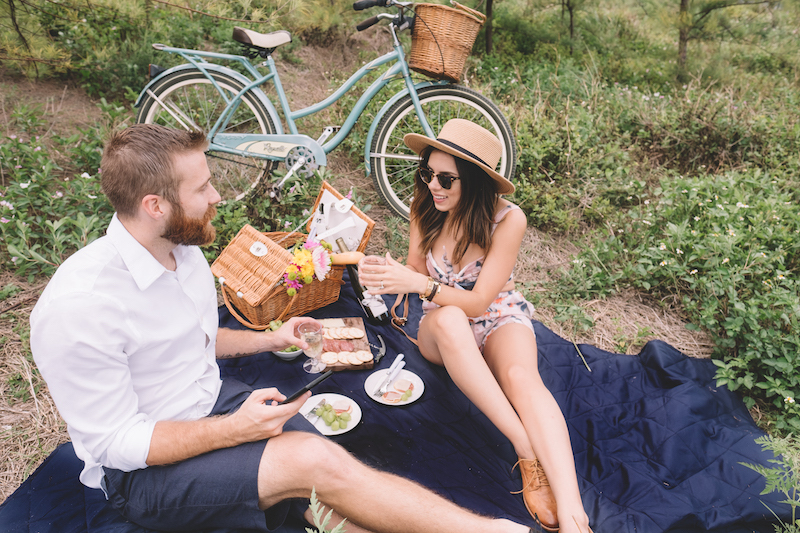 Fun fact: When Gaby was trying to propose, he wanted to do it during a romantic picnic. This big event in our lives kept postponing itself because he kept looking everywhere for a picnic basket and blanket. We finally found them- which meant no excuses for a romantic picnic for two. 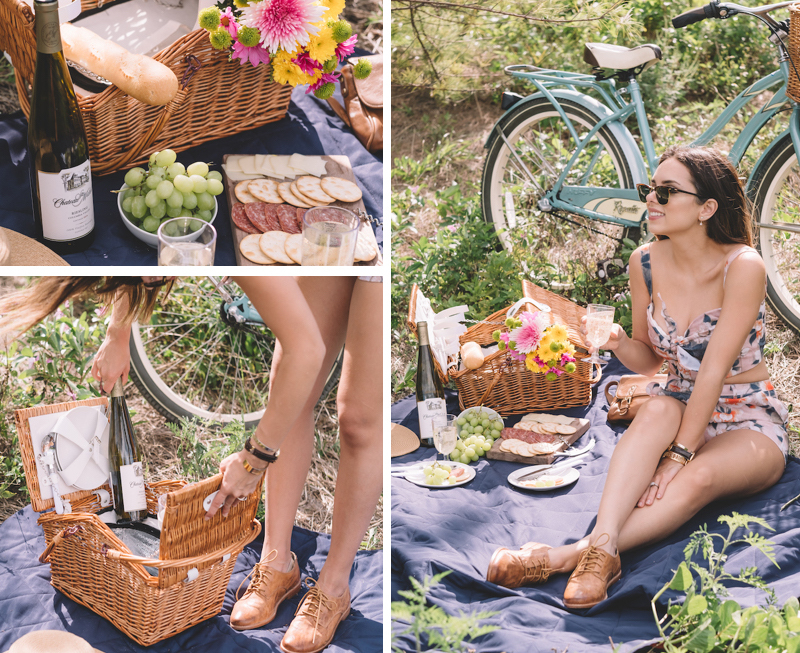 We headed to a local park on my retro bike with wine, cheese, grapes, and bread. What to Wear: a two-piece set is a great option! This short + crop top set is perfect for summer! The goal is to create a casual but cute outfit that is comfortable (especially if you are going to be sitting on the ground!). Also, go for flat shoes or wedges- comfort first! Perfect Wine Pairing: Chateau Ste. Michelle 2014 Columbia Valley Dry Riesling - refreshing, fruity, and elegant. Summer is the best time for music festivals/concerts. Last year I went to Bonnaroo; and this look is a great option if you are planning to go to Bonnaroo, Lollapalooza, Glastonbury or Coachella. What to Wear: a summer music festival is the time to show the world your inner boho girl. Go for denim, crochet, fun wide brim hats, breezy fabrics, or fun prints! This is my go-to boho outfit: denim shorts, a graphic tee, and a third layer (which can be a kimono or a long crochet vest). Since most music festivals are in fields (think grass, dust, mud), my recommendation is closed toe booties- but gladiator sandals are always fun. 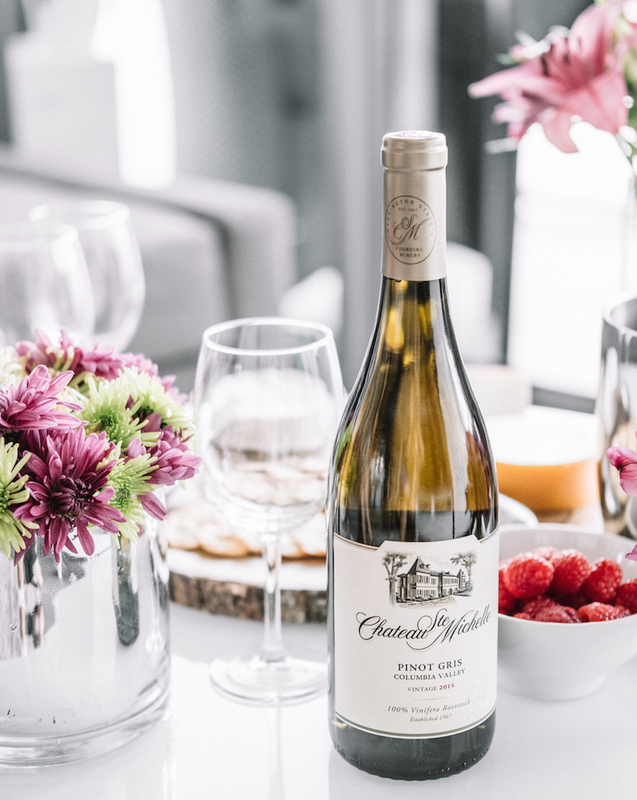 Perfect Wine Pairing: Chateau Ste. Michelle 2015 Indian Wells Columbia Valley Chardonnay- tropical and sweet, but with character. This summer, I’ve made a promise to spend more time by the ocean. I absolutely love the sand and the sea. I live 15 minutes from Miami Beach. However, I’m ashamed to say I rarely go. What to Wear: the absolute musts: a super cute swimsuit + sunglasses + sunscreen! The rest, you can wing it! You can either do denim cutoffs with espadrilles like I did, a men’s oversized shirt with a fedora, or silk caftan in a pretty print! 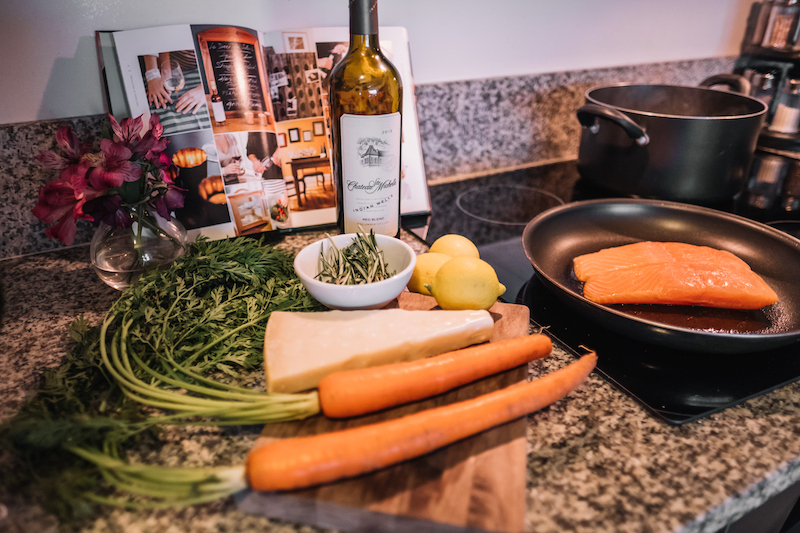 Perfect Wine Pairing: Chateau Ste. Michelle 2014 Columbia Valley Sauvignon Blanc- this one is a favorite with oyster- so if you are by the beach and can order them, do so. Did someone say yummy food and great company? I invited my closest friends to a barbecue in my building and we cooked some delicious hamburgers. 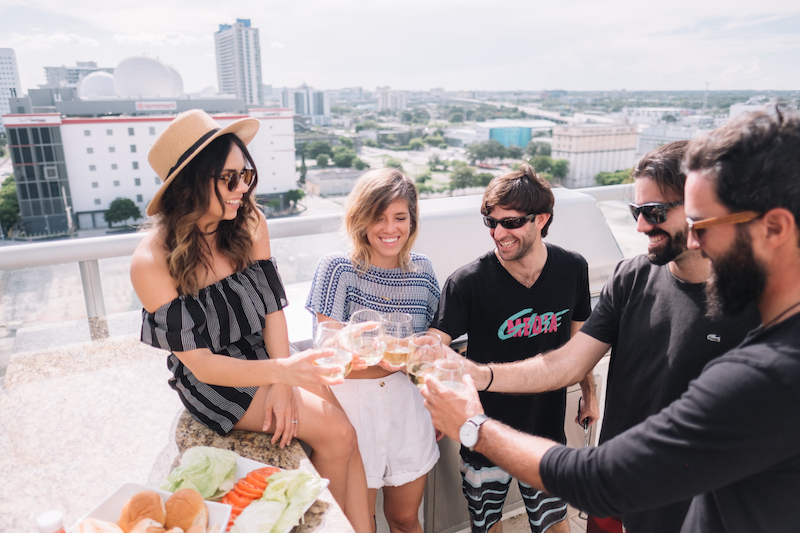 It doesn’t matter if it’s in a local park, your own backyard, or at a friend’s rooftop. 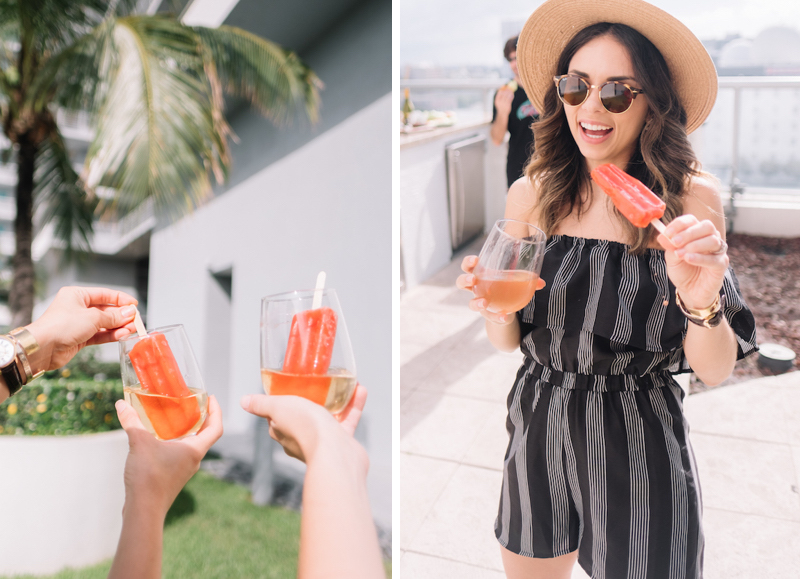 A bbq includes everyone’s favorite things: sun, food, drinks, and friends and an opportunity to show off your summer style! 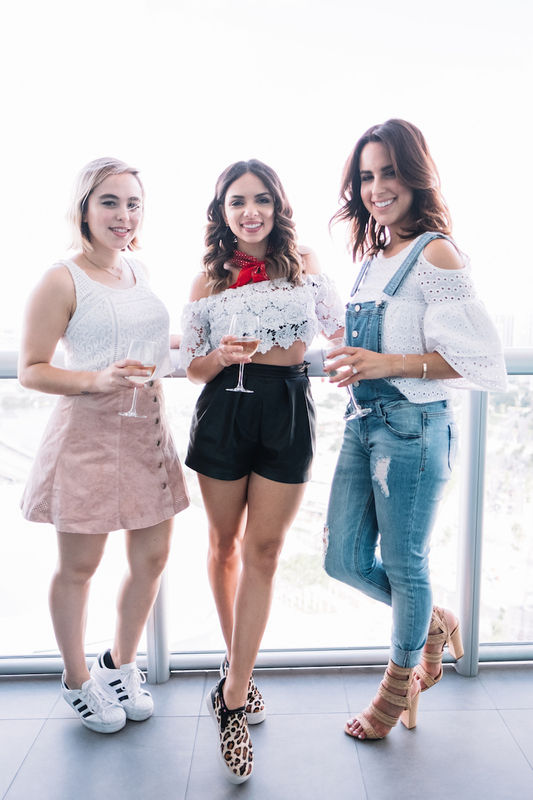 What to Wear: you can either do a cute summer dress with a denim jacket and camel wedges denim shorts, lace top, and an army jacket or my fave current trend: off the shoulder!! I went for a romper for even more comfort and gladiator sandals. Perfect Wine Pairing: Chateau Ste. 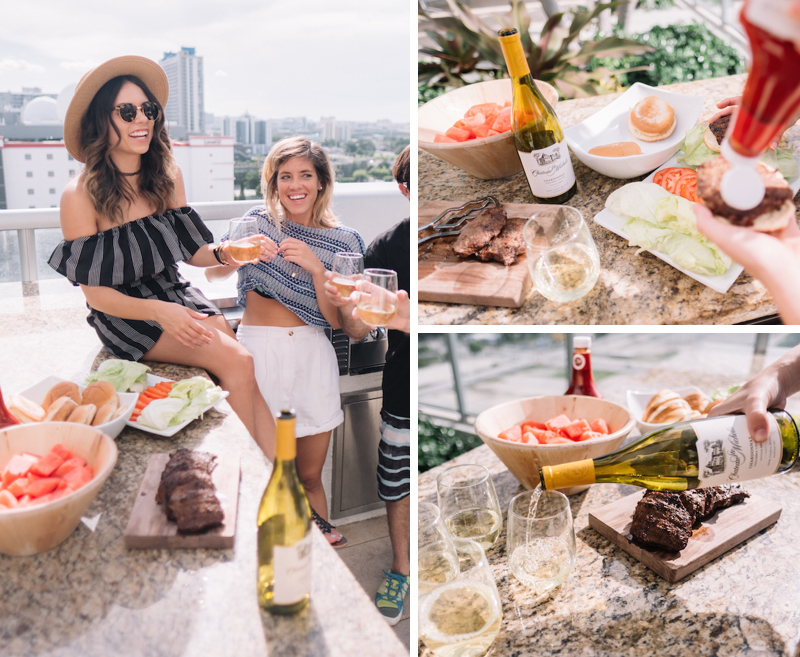 Michelle Columbia Valley 2014 Chardonnay - yes, we were eating meat; but this fresh Chardonnay was perfect for a hot Miami Saturday. I publicly admit that I’m not the best cook, recipes make me a little nervous! However, that doesn’t mean I don’t enjoy cooking for (and with!!) the hubby, and making it a romantic date. I actually think I’m getting better and better. I’m great at improvising (problems come when I try to make that good meal again - whoops!). 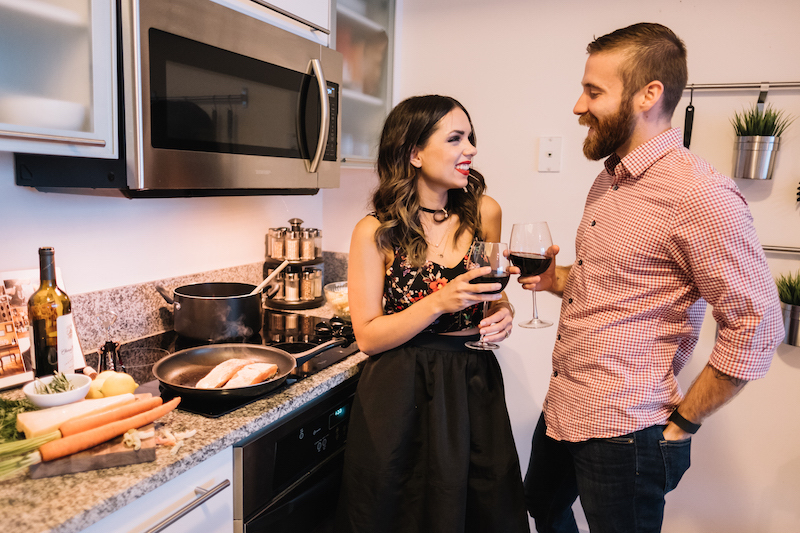 We always help each other in the kitchen- yay for modern relationships, right? 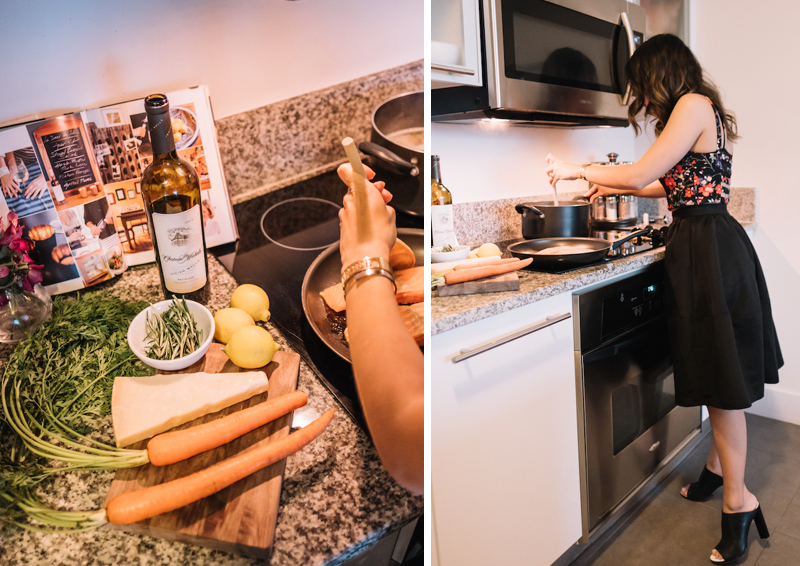 I personally love cooking together, it’s more intimate and fun! Perfect Wine Pairing: Chateau Ste. Michelle 2012 Indian Wells Columbia Valley Red Blend -rich and luscious, just like a perfect date! I’m more of an introvert. Don’t get me wrong, I absolutely love spending time with friends, but I need to recharge with some me-time at home after a whole day of socializing! 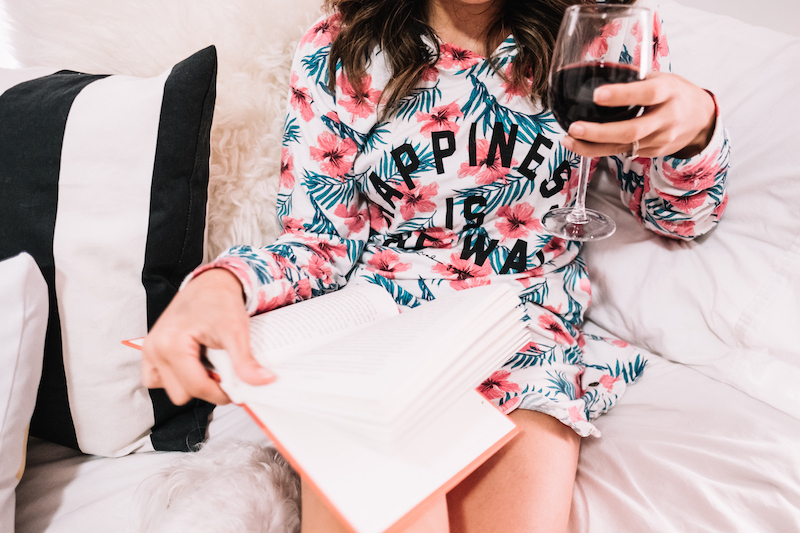 Some days I get manis, some days I just binge watch Netflix, and some I just spend curled in bed with a good book and a glass of wine. I’m currently reading Big Magic by Elizabeth Gilbert (the author of Eat, Pray, Love) -absolutely recommended! It has made me cry, smile, and re-evaluate many things in life. Check out these 10 Summer reads HERE!! What to Wear: comfy pajamas and no make-up - what’s better than that!? I recently got this shorts + hoodie floral pajama that I can’t stop wearing it; it’s so cute!! I’ve made some amazing friends in the blogger world. Even though I love disconnecting from work - we understand each other in this crazy fun industry. Most of us met at events, and it’s always nice to see each other in an environment that does not involve using specific hashtags and handles. 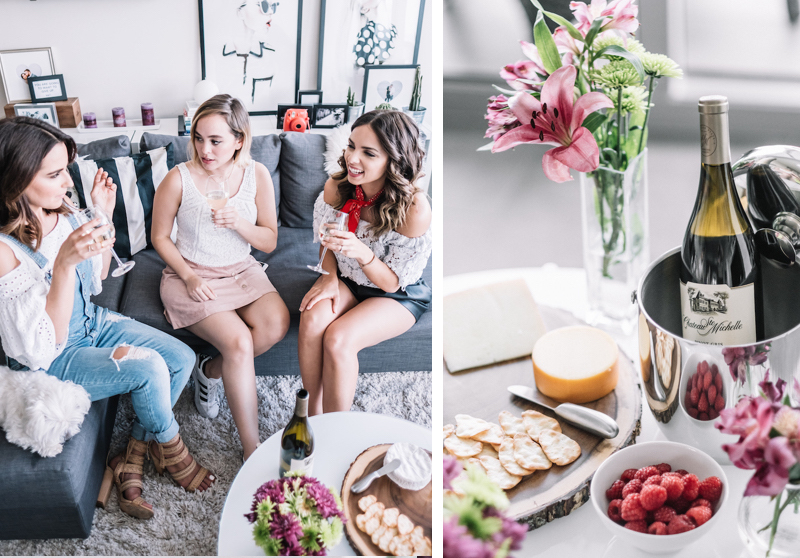 I invited Kelly Saks and Andrea Eraso for some girl-time, wine, and cheese at my place; and it was a delight, I absolutely love these girls! What to Wear: I would go for those trends that guys don’t necessarily get, but you know your girlfriends will love - look at Kelly rocking those overalls. I’m wearing the red bandana around my neck (which still confuses Gaby a little bit). Personally, I wouldn't wear heels; and I instead I wore these super cool leopard slip-ons. Perfect Wine Pairing: Chateau Ste. 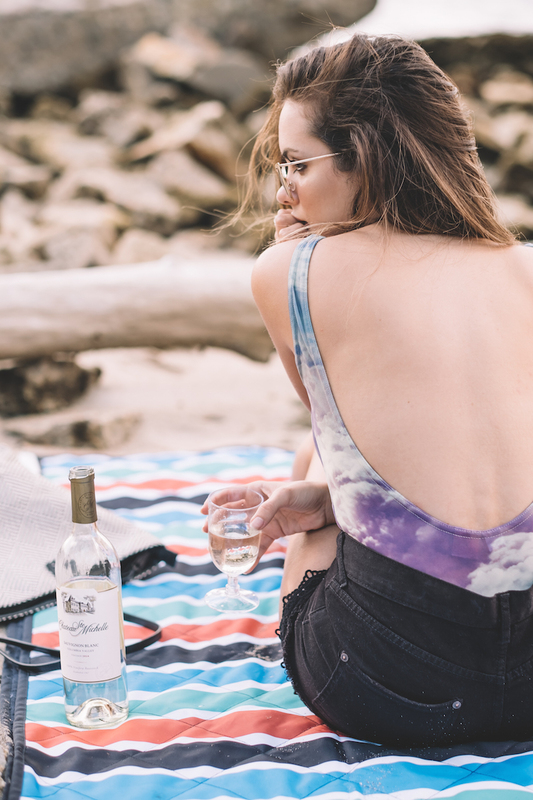 Michelle 2015 Columbia Valley Pinot Gris- a great option for the girls since it has fresh flavors of pear, melon, and spice. Oh I love weddings! I love dressing up for weddings, I love attending weddings! I love celebrating love! What to Wear: well, it really depends on the dress code of the wedding. All weddings are different so don’t be afraid to ask the bridal party (you can even send your point of contact pictures to make sure you will look your best as a guest). For a wedding during a hot summer day, I would wear this red bubble asymmetrical dress. The fabric is light, it has movement, and it’s a great color for summer. Just finish the look with luxe details. Perfect Wine Pairing: Chateau Ste. Michelle 2013 Indian Wells Columbia Valley Merlot- with berry fruit aromas, it is a great warm climate Merlot. 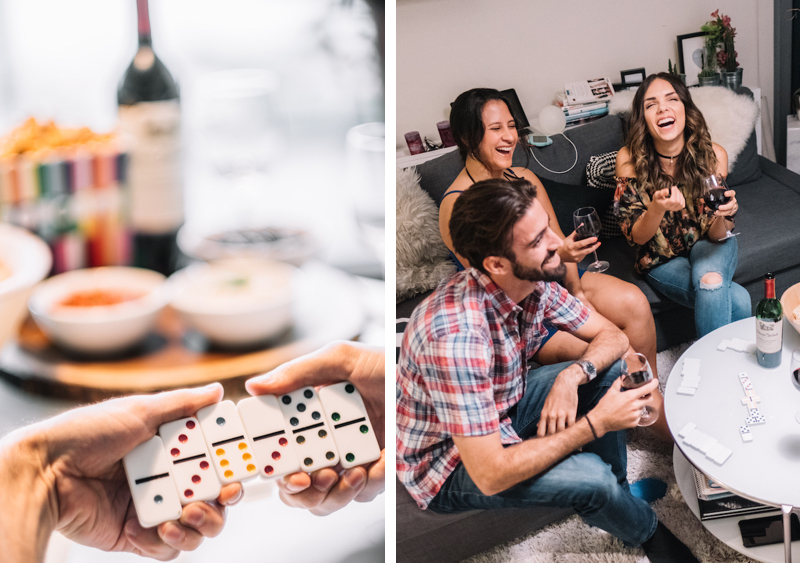 I think game nights are my favorite type of get-togethers with my closest friends- maybe because they are so much fun! Just give us a deck of cards and we will be entertained for hours and hours! This night, I told my friends to bring different types of games: so we had options...from Monopoly and Mexican train to dominos and Jenga- it was a blast. What to Wear: always go for the stylish you, but you should be able to sit on the floor (or even jump around - especially if you end up playing “heads up”). 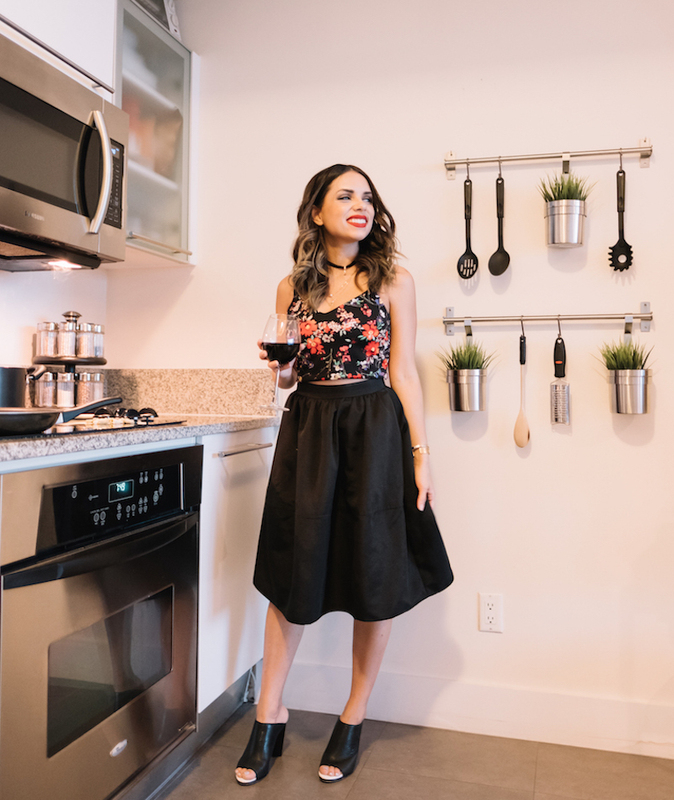 My recommendation is to wear comfortable jeans, shorts, or leggings instead of short skirts and flirty dresses (leave those for dinner dates!). I paired my favorite petite jeans with a floral off-the-shoulder and a cute choker. Perfect Wine Pairing: Chateau Ste. Michelle 2014 Columbia Valley Cabernet Sauvignon- just be careful when playing, no red stains on the white carpet! I have never been a party girl; but I do enjoy the occasional fashionable event with my girls. Instead of texting “what are you going to wear” and sending many outfit options - make it a dress-up party! Get ready with your friends like good old times - bring a couple of extra options in case you are not sure what to wear. 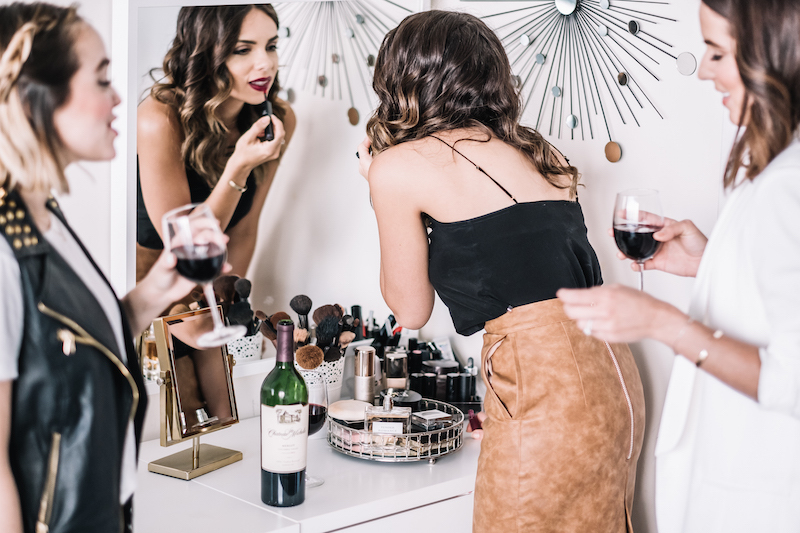 Do you hair and makeup together while sipping red wine and exchanging stories and then head out together for the party! What to Wear: try something daring that makes you feel confident and beautiful. This is the time for experimenting with a trend - try an edgy lip color or a fashion forward piece! Perfect Wine Pairing: Chateau Ste. Michelle 2013 Columbia Valley Merlot- the perfect any time red with layers of rich dark red fruit flavors! What about a trip to Seattle for two and tickets to Chateau Ste. Michelle's concert series? To enter, just post a picture to Instagram or Twitter with your perfect sip using the hashtags #10PerfectSips #Sweepstakes. The more photos you share, the better chances to win. All information is also available at this link. FTC Disclosure: This is a paid post by Chateau Ste. Michelle All opinions are my own. The content was 100% curated by me. I only partner with brands I love and would purchase myself. Chateau Ste. Michelle gave me their wines to try & pair with 10 stylish outfits as part of their 10 Perfect Sips Summer Program. Love this post! 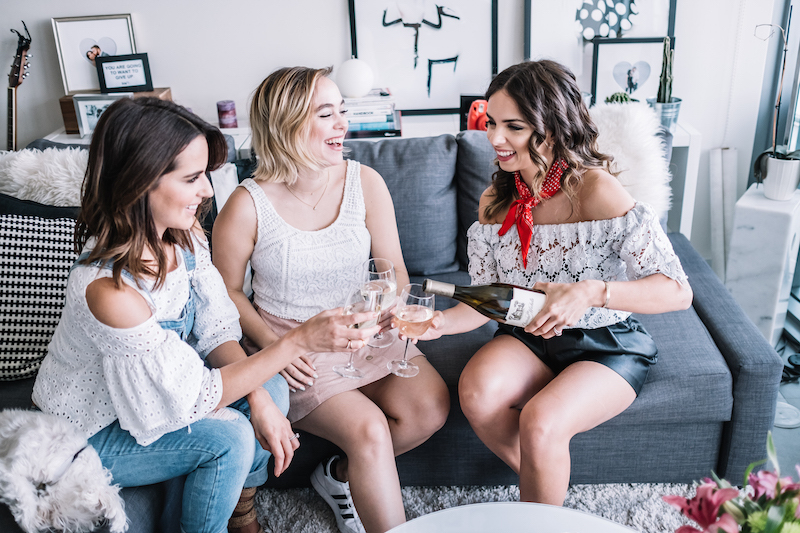 All your outfits are fab and who doesn't like wine? !